Listener Eric asked if there was any truth to the medieval rumor that the legendary Hrolfr Granger- a man so enormous that no horse could support his weight- was actually Rollo of Normandy. Believe it or not this was a question of such fierce debate in the early 20th century that it spilled into national newspapers and became the subject of several angry diatribes. 1911 was the 1,000th year anniversary of the founding of Normandy and there was much Scandinavian pride in this native son made good. The trouble was that no one was exactly sure where Rollo came from and both Denmark and Norway claimed him. Norway especially was proud of its distinct national character (they had just broken away from Sweden in 1905) and wasn’t about to let Denmark steal their thunder. What made the argument particularly fierce is that there is so little reliable information about Rollo’s origins. The earliest source (Richer of Reims- circa 996) gives Rollo a Danish origin, but he makes no distinction between any Vikings, referring to all of them as Danes. Where exactly each roving band of raiders originated was not that important to those who had to fend them off. The Norse sagas on the other hand (circa 12th century) all claim that Rollo (whom they call Hrolfr Granger) was from Norway as does the French Chronicon de gestis Normannorum and the Welsh Historia Gruffud vab Kenan. The Normans themselves were split on the subject. Dudo of St. Quentin (1030) gave Rollo a Danish father while Geoffrey Malaterra (1090) gave him a Norwegian one. The truth unfortunately is that we will probably never have conclusive proof either way. I tend to think that the Norse account of Hrolfr Granger contains a healthy dose of legend but that it can loosely be connected to Rollo. 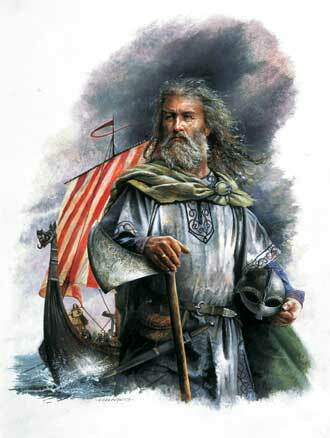 The medieval sources, when they bothered to distinguish between different groups of Vikings, usually came down on the side of a Norwegian ancestry. Hardly an airtight case, but most likely the best we can do.